Welcome June! In honour of the new month & season (it is HOT here! ), I thought it was about time to reinstate the item of the day. It's been far too long since I've featured some of my favourite Etsy items! A perfect start to this once-again-daily feature? 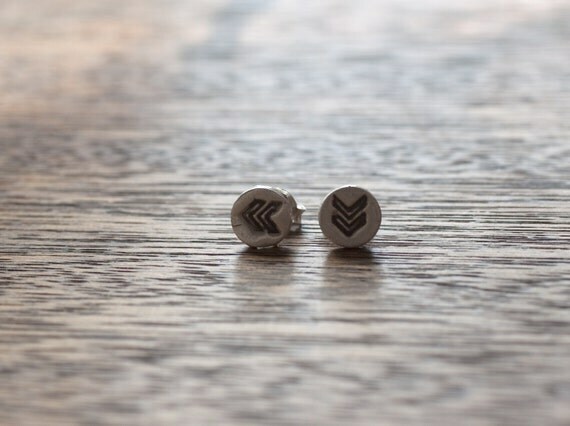 These darling chevron earrings by truche. I'm really tempted to get them for myself - I've been dreaming in chevron since one of my favourite bloggers, Kate, declared it the next pattern craze. They'd be great everyday studs! I love those earrings! Aren't chevron stripes addicting? I'm in love!